Syrian Rebel Leader: We Won't Share U.S. Arms With Extremists The U.S. says it will consider arming the rebels if it can confirm Bashar Assad's regime used the nerve gas sarin in recent attacks. But there's a danger that any weapons the U.S. provides could fall into the wrong hands. 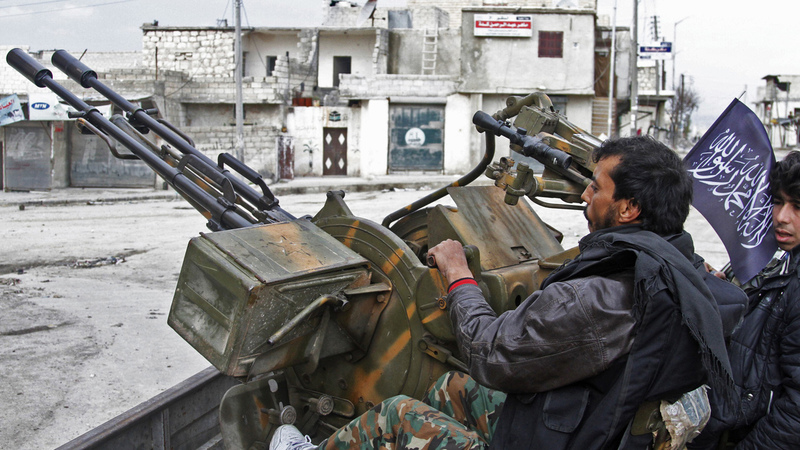 Free Syrian Army fighters sit behind an anti-aircraft weapon in Aleppo, Syria, in February. The rebels say U.S.-provided weapons would help in their fight against Bashar Assad's regime. The Obama administration says it's considering providing arms to rebels fighting to bring down Syrian President Bashar Assad if the U.S. can confirm his forces did in fact use the debilitating nerve gas sarin in recent attacks. Coupled with news that Israel reportedly launched an airstrike at a target in Syria to prevent a shipment of missiles from reaching Hezbollah, these events could represent a game changer in the conflict-ravaged nation. The so-called Free Syrian Army is not a traditional army, but instead made up of many small battalions and brigades that have come together to fight Assad's regime. According to Brig. 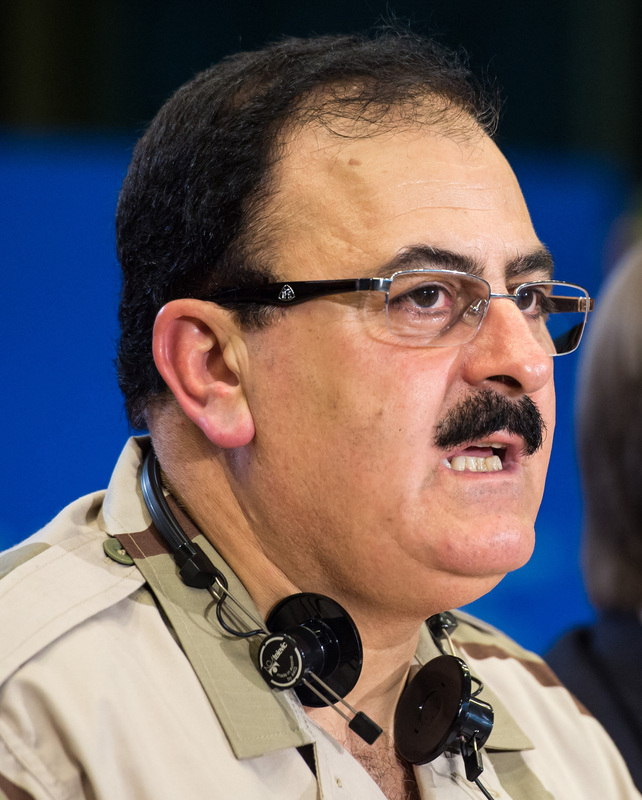 Gen. Salim Idris, the rebel group's chief of staff, it doesn't operate like a traditional fighting force. Brig. Gen. Salim Idris says the Free Syrian Army would not share U.S.-provided weapons with extremist groups. "I don't like to say that we are working just like a regular army because the majority of the forces are civilians," Idris tells NPR's Kelly McEvers. Idris would likely manage any military assistance the U.S. decides to provide. The U.S. and its allies believe he represents the so-called "moderate" fighters — those who want to topple the president and install a democratic government. A senior Obama administration official told NPR the weapons the U.S. would most likely provide are shoulder-fired missiles, which could take down aircraft. That would be a good start, Idris says, but it would not be enough. "We need other kinds of traditional weapons," he says, "because the regime is supported by Russia and Iran, and they have many, many kinds of weapons and a lot of military units." Idris says he would like to see a full no-fly zone in Syria, but the U.S. supports only partial no-fly zones, where civilians would be protected and rebels could regroup. He says it wouldn't be enough to protect the liberated areas. "The regime has a very powerful air force," he says, "and when we have only a no-fly zone in the north and the south, it will be not enough because they can [still] use chemical weapons and aircraft against our citizens." Idris says the regime is using Scud missiles and wants more pressure from allies to prevent the use of the Russian-made ballistics. If the U.S. does give weapons to the Free Syrian Army, there is also the danger of those weapons falling into the wrong hands. Hard-line Islamists that don't answer to the group and are more in line with al-Qaida are also fighting Assad's regime. Idris says the Free Syrian Army doesn't coordinate with factions that don't fall under its command structure and that it doesn't share weapons. How Will Obama Make His Case On Syria? "They don't like to share with us [either]," he says. "All of the members of the Supreme Military Council agreed ... not to share anything with the extremist groups." He says the rebel army will work hard to keep track of the weapons, should the U.S. provide them. "We are ready to make lists of the weapons and write down the serial numbers," he says. "The Free Syrian Army is very well organized and when we distribute weapons and ammunition we know exactly to which hands they are going." Idris says that when the regime falls, they will be ready to give back all of the weapons. It remains to be seen whether he could hold his men and commanders on the ground to that plan. Note: The audio at the top of this page also includes a piece on Syria-related kidnappings, as well as an interview with filmmaker Olly Lambert, whose documentary Syria Behind the Lines is currently available on Frontline PBS.